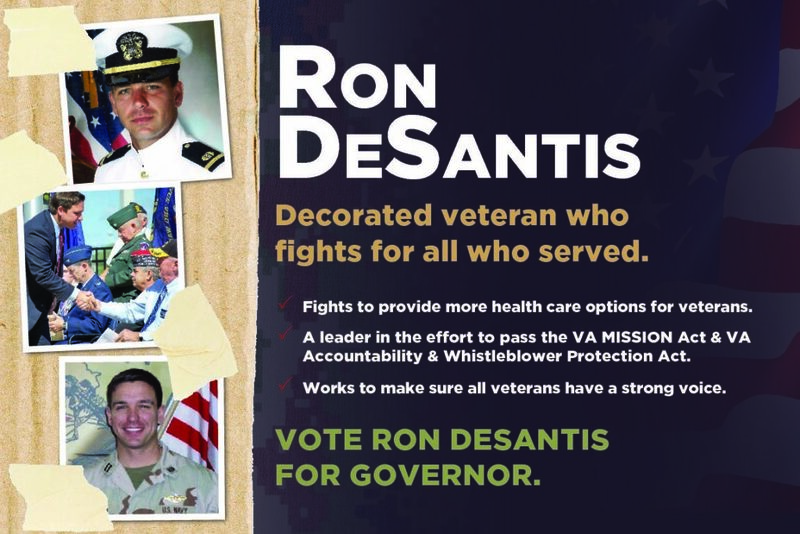 TALLAHASSEE, FL – Concerned Veterans for America Action (CVAA) on Tuesday announced the launch of a six-figure direct mail campaign to urge Floridians to vote for Ron DeSantis for Governor in November. The mail piece highlights the Iraq War veteran’s record of being a leader in the effort to reform the Department of Veterans Affairs (VA) to ensure that Florida veterans have better access to the health care and benefits they earned. View the first mailer by clicking HERE. DeSantis has consistently supported more health care choice for our veterans to ensure they aren’t forced into or trapped in failing VA hospitals. Most notably, he supported the VA MISSION Act, a critical piece of reform legislation to temporarily stabilize the failing Veterans Choice Program (VCP) and stand up a new, more accessible community care program. Going back to 2016, DeSantis understood the shortcomings of the VCP and outlined more viable alternatives, similar to what the VA MISSION Act stipulates. Further, DeSantis was a leader in the fight to make it easier to hold VA employees accountable when they engage in misconduct. Multiple times he co-sponsored and supported key pieces of legislation to bring more accountability to the VA, including the VA Accountability and Whistleblower Protection Act, which was signed into law in 2017. Additionally, in light of scandals showing the VA routinely overprescribed medication, DeSantis embraced alternative forms of treatment to treat veterans while mitigating opioid dependency chances. In 2017, DeSantis introduced the Puppies Assisting Wounded Service members Act of 2017 (PAWS Act), which would create an innovative pilot program that would create a private-public partnership with nonprofits to test the use of service dogs to treat PTSD. The program would be paid for by cutting VA overhead. DeSantis, who spent five and a half years representing Florida’s 6th Congressional District in Congress, served six years on active duty in the U.S. Navy. During his time in the Navy, he deployed to Iraq in support of Operation Iraqi Freedom and to Guantanamo Bay, Cuba. He is still serving as a Lieutenant Commander in the U.S. Navy Reserves, and is running for Governor in Florida.